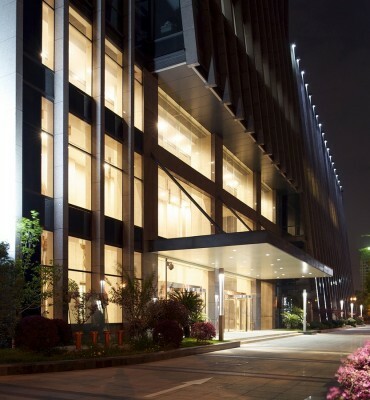 The Hongcheng skyscraper is located on the banks of the Qiantang River in the new administrative and business district of Hangzhou city and home to the offic-es of various companies. 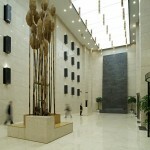 Commissioned by the buildings owner, the brief called for a unified interior de-sign throughout the common areas that included an upgrading of the main lobby, foyers, corridors and amenities. 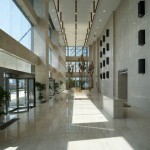 The 3 story high entrance hall spans approxi-mately 450 square meters to form the central reception, waiting and information area of the overall complex. 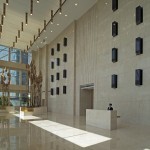 Views of the beautiful parklands opposite the main entrance are optimized through the use of extensive facade glazing. 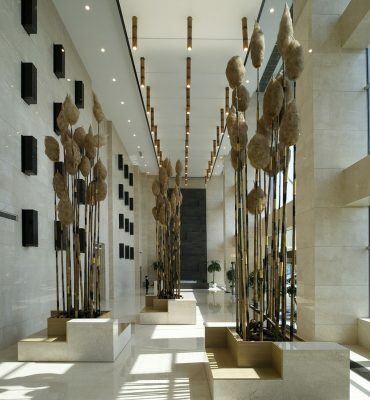 The configuration of the entrance hall has been inspired by the natural landscape, reflected through the use of organic elements. 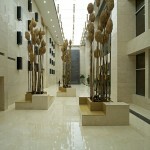 A bamboo grove, natural stone blocks, and cascading water fea-ture define the spaces functional zones to create a series of themes landscapes. By limiting the use of the various surface materials, the subtle combination of jurassic limestone, granite and bamboo amplified the experience of the spatial landscape. The result is a harmonious interaction between inside and outside, the elements and materials. The bespoke translucent glass ceiling and overlying grid of bamboo rod down lights allow for varying levels of illumination that can be adjusted to the time of day of desired atmosphere.